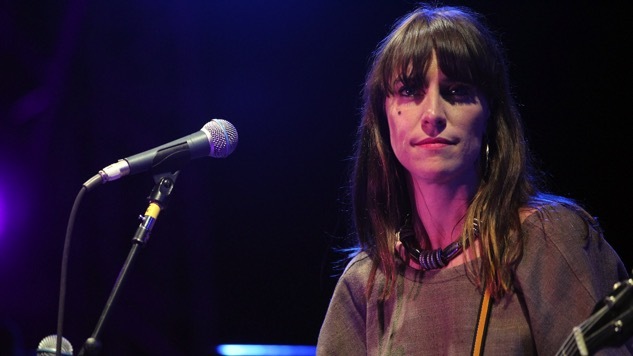 Earlier this week Feist announced that she would be putting out her fifth studio album, Pleasure, almost six years after she dropped the under-appreciated Metals. Now the indie folk-rock singer has unveiled the title track from her forthcoming LP and it’s a major left turn for the Broken Social Scene member. Here, Feist screams and hollers more than anyone who’s only familiar with “1234” and “Limit to Your Love” might remember. In fact, there are points where the straining vocals she uses almost recall some of Jandek’s experimental blues meanderings. Certain riffs in the starkly lo-fi cut absolutely call to mind the rawest and grimiest of blues rock. PJ Harvey is a totally sensible touchstone for what’s happening on “Pleasure.” Still, Feist tempers the tune with just enough light (in this case, a few flutes) to make it less oppressively dark. Pleasure drops April 28 through Interscope, and is available for preorder here. Check out the title track below, and find the new album’s cover art beneath that.